The commercial grade Backyard Waterslide is 13' of fun! This cost friendly inflatable waterslide is perfect for any rental business, church, school, or other organization. The commercial grade Backyard Waterslide is 13' of fun! This cost friendly inflatable waterslide is perfect for any rental business, church, school, or other organization. 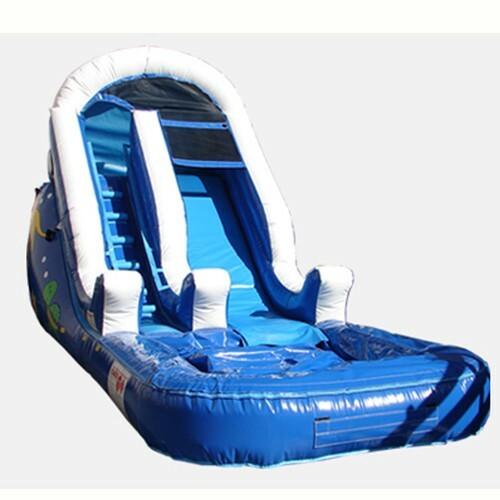 Featuring a 13' tall waterslide with landing pool this unit is sure to provide summers of fun! Our newest Water Slide is perfect for any backyard party! Weighing only 210 LBS, it can be set up and transported quickly and easily! This Water Slide features a Drain at the bottom of the unit to help remove any excess water. Our Slides with Pools have a unique Inflated Landing Pad that helps protect the rider when there isn't enough water in the pool or if the slide is used dry with ball pit balls or foam blocks.